Hanging up the laundry this morning, I found this lovely beetle making its way along the washing line. It’s a eucalyptus tortoise beetle (Paropsis charybdis). I see them occasionally, but with only one eucalyptus tree in the yard, they’re not common. I’m quite fond of tortoise beetles. This one isn’t much to look at, but many species are sparkling gold, and my first glimpse of them, as a kid, was a truly magical experience that I’ve never forgotten. 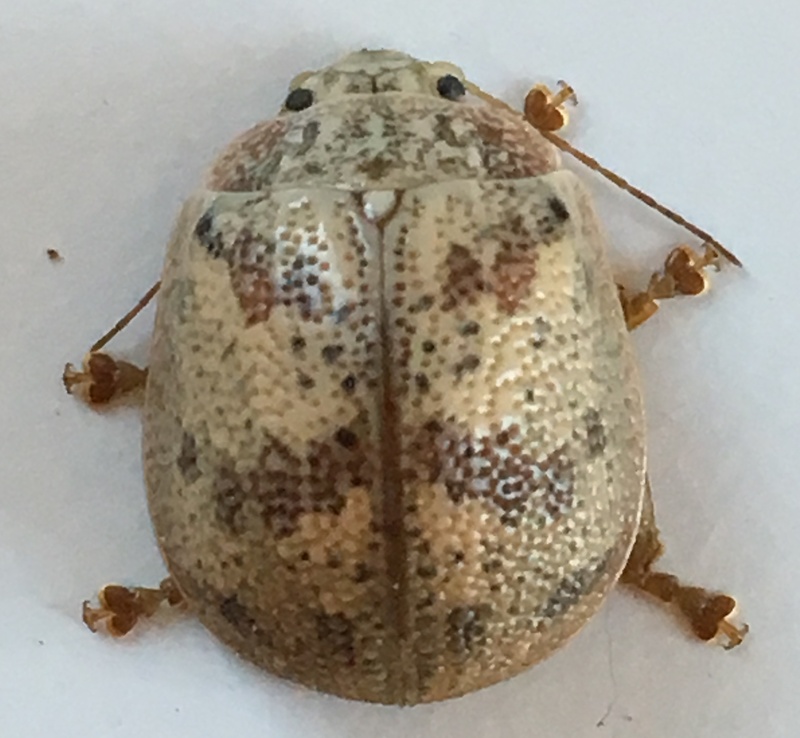 What tortoise beetles have in common is their domed tortoise-like shape. Their shape, combined with some pretty awesome feet is what keeps them safe. 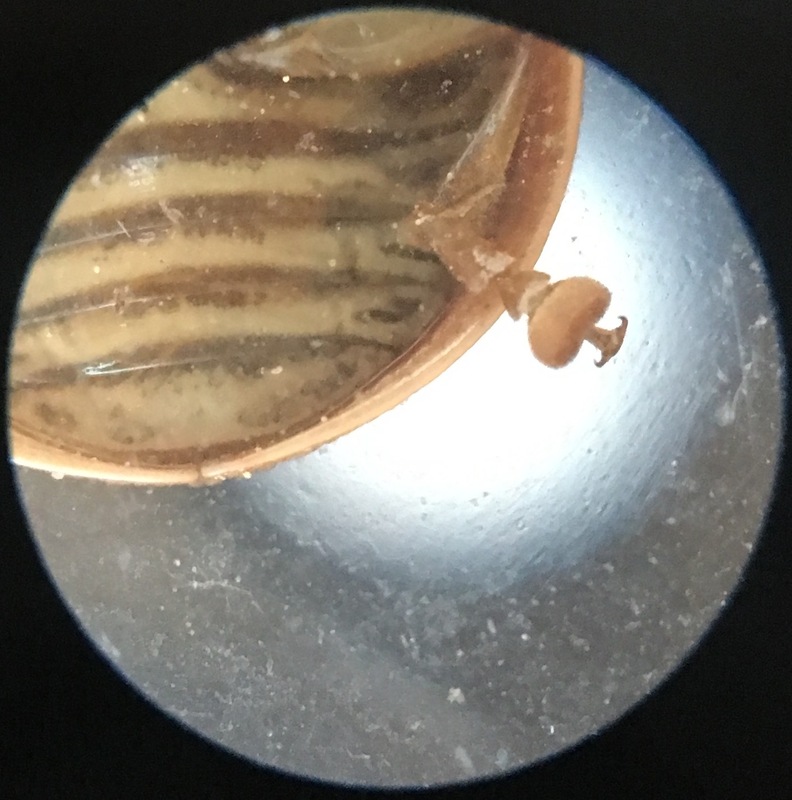 Tortoise beetles have wide pads on their feet (this one obligingly sat on a clear surface and showed its feet under the microscope). The pads are covered densely in short hairs, like the bristles of a toothbrush. Each hair is moistened by oil, which helps it stick to the waxy surfaces of leaves in the same way two wet drinking glasses stick together if they’re nested. The oil bonds to both surfaces and acts as glue. When disturbed, the tortoise beetle presses its feet against the surface, employing as many as 60,000 sticky bristles (about 10 times more than other beetles have) to keep it attached. These sticky feet, combined with the dome-like shape make it difficult for predators to dislodge the beetle. Entomologist Tom Eisner performed a series of elegant experiments with the palmetto tortoise beetle, attaching weights to the beetles to see how much force they could withstand before being pulled off a leaf. He found they could hold up to 240 times their body mass. Those are some seriously sticky feet! So if their feet are so sticky, how do they walk? Eisner showed, by looking at palmetto beetle footprints on glass, that when they walk, they don’t let all the bristles on their feet touch the surface. Their full adhesive power is only deployed for defence. I don’t think anyone has tested eucalyptus tortoise beetle grip strength, but it’s definitely impressive. I popped this one into a narrow jar, and it never hit the bottom—it reached out with one leg, like some movie superhero, and grabbed the smooth wall of the jar, arresting its fall. Then, when I tried to get it out of the jar, it stuck like glue to the side. I had to slide a stiff piece of paper under its feet, prying them up one by one. It was obliging for the photo shoot, but when I tried to let it go, it stuck itself to the paper. It took a few determined nudges, but eventually I got it to the edge of the paper and it dropped off. The eucalyptus tortoise beetle is not native to New Zealand, and is considered a pest in the forest industry here. Still, I have to admire the beetles’ sheer tenacity, and am willing to share my eucalyptus tree with them for the opportunity to see those sticky feet in action.